I’ve been binge watching Gilmore Girls ever since it was released to Netflix and I have a lot of thoughts, and a lot of love, for this show. Sure, I could binge watch this show any day of the week (hello, full series DVD owner over here) but there’s something more fun about being able to just stream it. Upon Googling this fun blog post idea about things Gilmore Girls has taught me, I realized I am not that original. But that’s okay, because there’s always room for more Gilmore Girls love, am I right? 1. Moms can be pretty cool. I didn’t always think so, but they are pretty cool. 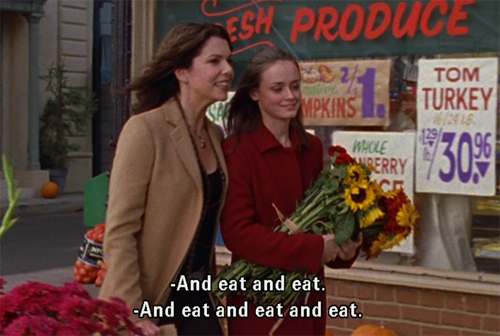 My relationship with my mom isn’t that much different from Rory and Lorelai’s (well, maybe with a few less pop culture references.) I’m an only child, so that means we were basically mom and daughter, and in a way, sisters and friends. It’s a bizarre relationship, but it works, and definitely is different from many of my friends relationships with their moms. 2. People aren’t always as they appear. Luke is an excellent example of this – he’s gruff and grumpy, but has a heart of gold and is a real sweetheart. Jess appeared to be a bad boy, but also had a sweet interior too. And even sweethearts like Dean can even royally mess things up for everyone in his life. 3. If you put your mind to it, you can do it. Lorelai wanted her own Inn so bad. Sure, a fire and a death may not have been how she wanted it to happen, but it did, and it worked out. Rory never let things stop her from getting what she wanted, even when she and the Jeep got hit by a deer. 4. Never tip the proprietor. 5. Eat what you want. It’s a good thing too, because eating is my favorite activity outside of blogging, and I hate exercise. It’s not so much the exercise itself, more the build up to do it and the sweatiness afterwards. Clearly I’d fit right in with the Gilmore clan. Sometimes we get Ds on our papers, sometimes we befriend our enemies, like Paris Geller. It’s all part of life, and making mistakes or misjudging people is just part of it. 7. You can’t pick the people you are related to, but you can choose your family. Even though they weren’t blood relatives, the people of Stars Hollow are very clearly Rory and Lorelai’s family. From Mia who provided Lorelai a place to work and live with baby Rory, to Miss Patty and Babette who kept up with everything in their lives, to Kirk who went so far as to install an alarm system to protect Lorelai when Rory moved away, the town of Stars Hollow really adopted them as their own. 8. You can totally smell snow. 9. Say what you mean. 10. Most of all, you only live once. In Omnia Paratus. …And that, my friends, is why Gilmore Girls will forever be one of my top 5 favorite shows ever. Now I’m just waiting impatiently for the movie. 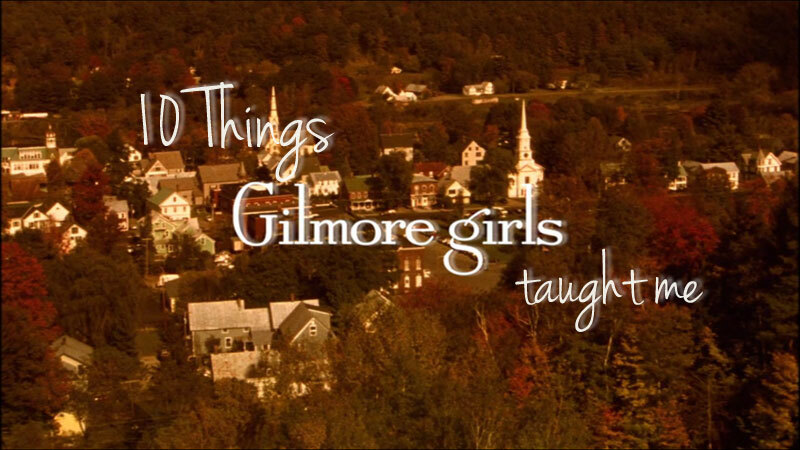 What has Gilmore Girls (or your favorite show) taught you about life? Haha, it’s definitely a way of life! My boyfriend has been watching it with me, and I think he’s been enjoying it… even if he won’t admit it! Ahh, one of the best shows ever made! I have been binge-watching this on Netflix as well! Glad we’re on the same page on the smelling snow issue. Love this show too! Such a classic! And yes, you CAN smell snow, I know exactly what you mean! I have been obsessed with GG since it came out. Love. I absolutely love this show. I watched it with my mom when I was about 15 years old (totally appropriate) and then last year rewatched it again. It’s incredibly smart and clever, while still being real and down-to-earth. Even my boyfriend was impressed, haha. Yes, Dave is quite enjoying it too (even if he won’t admit it!) I watched it with my mom the first time through too! Oh goodness I love Gilmore Girls so much! I really like your take on the lessons learned. I definitely agree with your first point: an only child (and I’m from a separated family) and her mother have a different relationship than others. It’s great that the producers made this the solid rock that the show was built on! Yes, totally agree! It’s such a unique parent-child relationship and I love how they captured it too! Haha I did a post similar to this once! How can one show teach us so many things? Love it. hahaha I love this! fellow only child! There’s going to be a Gilmore Girls movie?!?!?! WHAT!??? Growing up, Gilmore Girls was probably the most influential show I watched. The show always somehow paralleled what was going on in the lives of my mom and I, so we’d joke that we were the Likkel Ladies instead of the Gilmore Girls. I can’t even begin to list the many things that show has taught me, but I agree with you – you can definitely smell snow!! I think it’s highly unlikely that it will be anytime soon, but there have been several instances where Lauren Graham has said she would do a movie or reunion show “if circumstances were right” (http://www.inquisitr.com/1468132/gilmore-girls-headed-to-netflix-in-october-talk-of-reunion-show-lingers/) Fingers crossed! I looove that GIF of Jess. I’m a DVD owner of all the seasons too, and I was still so so excited for it to be on Netflix!! Love this post. My hubby and I adore Gilmore Girls! We bought the series and have watched it through together once already and will again I’m sure.I still catch reruns on tv too! I want to live in Stars Hollow!